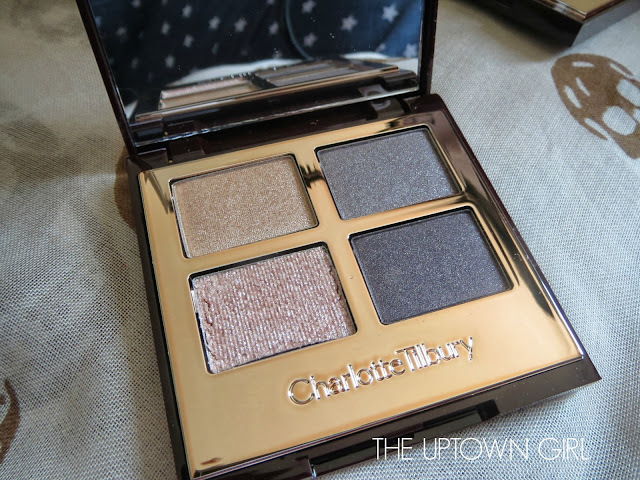 I may or may not have let out a little squeal when I heard Charlotte Tilbury was bringing out a make up collection. Pre-launch I watched all her YouTube demo videos-they were all a bit same-y to be honest but the products looked divine. I picked up A LOT from the collection-pictures of my entire haul are here on my blog. Here's my thoughts on The Uptown Girl Luxury Palette. Charlotte has designed these colour coded palettes containing 4 shadows each with a different theme. I am SO pleased she has decided not to include one of those crappy little foam applicators because I have binned every single one I own. Having said that I recently read a great post by Christina with some great tips on what you can do with those foam applicators. The palette is compact and slim, dark brown plastic with rose gold trim. Simple but classy and extremely light. Inside is a large mirror and the 4 shadows are set inside a rose gold plate with Charlotte Tilbury engraved underneath. I like it a lot. 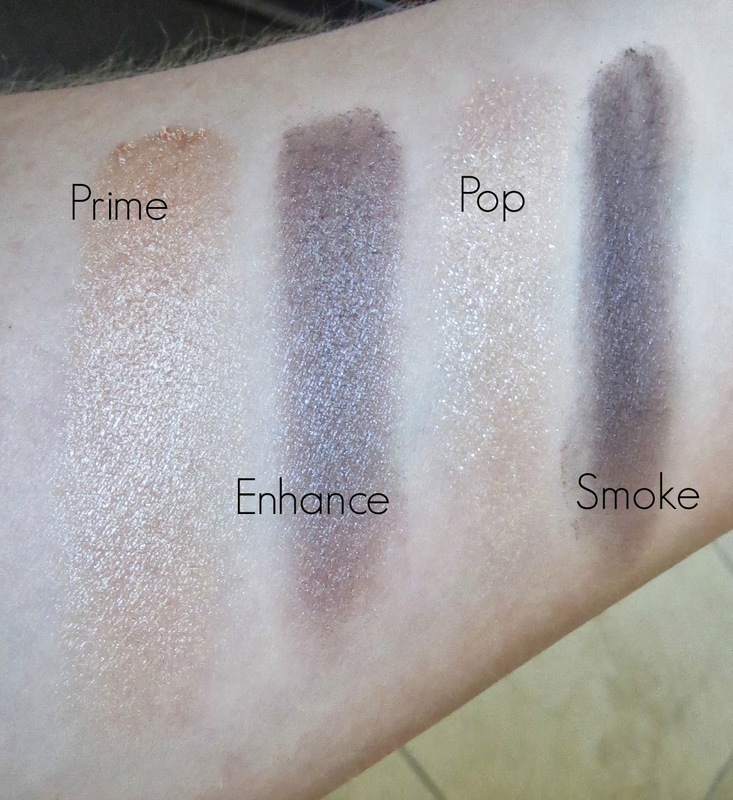 The 4 shades do not have individual names, all of the eyeshadow palettes have the same designation for the 4 shades-(going clockwise from top left) prime, enhance, smoke and pop. The Uptown Girl palette is a classic combination of creams and greys and Charlotte says this look has been inspired by Grace Kelly, Kate Middleton and Liz Hurley. Swatched, the colours are stunning: complex and multidimensional in the light. The prime shade is designed to be applied all over the lid. The shade is velvety soft but because of this has a lot of fallout. You can actually see from the very last photo the shimmer left under the eye from this shadow even though I have brushed it away. But it's a beautiful colour, a peachy champagne (very similar to Stila Kitten) and I pack it on the lid with a Mac 239 brush. I always use a primer under eye shadow, today I used Mac Paint Pot in Bare Study. The enhance shade is designed to be applied through the crease and outer corner. Another beautiful colour, a shimmery taupe that leans mauve in the light and has much less fallout. When you blend this colour it can have a tendency to blend away to almost nothing as it blends so easily (I use a Mac 217 brush) but it's very easily buildable. The smoke shade can be used through the crease and outer corner in the evening or along the lash line. Again, butter soft and easy to blend with little fallout. A great shade to take the eye from day to night and the ease at which is blends gives me more confidence in doing a smoky eye because it's quite difficult to 'overdo' it and apply too much because although the shadow applies dark at first, it's so easy to blend out. The pop shade is designed to be placed in the middle of the eye to add a little more sparkle for evening. In all of her tutorials Charlotte applies this to the centre of the lid using her finger. This opalescent glitter shade feels dry and gritty in the palette but applies to the lid well and the glitter does not stray once on the lid. This shade adds an extra iridescence to the eye. The prime shadow has an extreme frost finish which I know will not be to everyone's taste. The enhance and smoke shades are shimmery but with more of a satin finish. They're not perfect due to the fallout but once on the lid they do NOT budge at all-they don't crease and they last all day. Instead of reapplying my eye make up to go out, all I needed to do was blend in some of the dark 'smoke' shade through my crease and the 'pop' shade in the middle of my lid. Here's how I wore the prime and enhance shade in the day today with a tiny tiny bit of the smoke shade along my lash line very finely. Here's the look Charlotte created on her channel, it's beautiful and I have resolved to get a bit more practise at blending to try and achieve this look. I think it may be wise to do eye make up first before the rest of my make up to ensure I can clear up those annoying flecks from the prime shade! HI from France ! I am looking forward to receiving the internet order I placed with some CT products. They are so attractive and rather difficult to be found in France, so thank you for this review, I will let you know my thoughts about the results of those products after using and testing them carefully (eye pencils, eyeshadows, the face bronze and glow, lipstick. The CT makeup being very expensive in France, I hope I will not be disapointed !